The decisive battles of the German Revolution ended in March 1919 with the bloody crushing of the workers’ uprising. Why did it meet such a fate? Thirty years after the fall of the Berlin Wall and over a century since the fall of the monarchy, the “November Revolution” of 1918–1919 still remains a controversial topic in German public life. Recent commemorations of the one hundredth anniversary were fairly sympathetic to these events, though this also underlined the degree to which the “revolution” and its history have today become little more than a museum piece. Some see the uprising as a transition to Germany’s first democracy, while others view it as a “revolution betrayed” — an attempt to create socialism that was violently repressed. The murders of Karl Liebknecht and Rosa Luxemburg in January 1919 are generally seen as the decisive turning point. But much less well-known are the decisive battles of March 1919, when a nationwide general strike called for the socialization of heavy industry and the anchoring of workers’ councils in the German constitution. The revolution was ultimately crushed by bloody force — over a thousand people were killed in Berlin alone. Yet its failure owed, more than anything, to deep-rooted contradictions within the workers’ movement itself. Such tensions had emerged during World War I, at the very origin of the revolution. Left-wing and revolutionary forces in the workers’ movement gathered into the Independent Social Democratic Party (USPD) in protest against the civilizational collapse, while the Majority Social Democrats (SPD) continued to support the war. The USPD was extremely heterogenous. It united committed revolutionaries like Luxemburg and Liebknecht but also many so-called revisionists like Eduard Bernstein who had been eager to transform the SPD into a reformist party even before the war. Their only real point of agreement was a rejection of the senseless bloodbath on the battlefields of Europe. The USPD as a whole thus had neither the will nor the strength to organize a revolution. Smaller groupings began to form in the party from the beginning, like Luxemburg and Liebknecht’s Spartacus Group or the network of “Revolutionary Shop Stewards” represented by radical trade unionist Richard Müller. While the Spartacus Group concentrated mostly on demonstrations and propaganda leaflets and the USPD agitated against the war in parliament, the shop stewards were the only ones who could build a revolutionary organization rooted in workplaces. Politically speaking, they were undoubtedly dependent on analysis put out by the Spartacus Group, but organizationally they were more deeply embedded in the working class than other left-wing groups. Emerging out of the German Metalworkers Union (DMV) around 1915, the Shop Stewards organized three large mass strikes between 1916 and January 1918, some with hundreds of thousands of participants across the country. These strikes were the result of careful preparation. At first, the Shop Stewards only protested the strike ban imposed by the war, but — influenced not least by the events of the Russian Revolution — gradually became dedicated revolutionaries. Only over the course of 1918 would the majority of workers come to understand that there could be no peace without revolution. Yet what would come after this revolution was not even clear to the revolutionaries themselves. The informal and clandestine Berlin “Workers’ Council,” in which delegates from the left wing of the USPD, the Shop Stewards, and the Spartacus Group had been discussing a common strategy since mid-1918, was devoted exclusively to debating how a seizure of power could work. When Richard Müller later said the Shop Stewards pursued a “council republic in the Russian style,” this perhaps represented an expression of radicalism hard to find in the workers’ movement before 1914. But this empty formulation in fact said little about the post-revolutionary order itself. Blueprints for a post-capitalist society drafted by vanguards have always proven illusory when faced with the test of events, and in the worst cases dictatorial. Facing censorship, military dictatorship, and the German police state, the Left in 1918 found it equally difficult if not impossible to develop a detailed revolutionary vision in dialogue with its social base. The revolution that broke out in fall 1918 was driven by two popular demands: overthrowing the monarchy and ending the war. The first happened on November 9, 1918, and the second was secured with the armistice of November 11, 1918. Officially, the country was now a “socialist republic” governed by a Workers’ Council. But what would come next? Should the provisional Councils develop into a more permanent system — or should a national assembly draft a constitution? The Left was divided over these issues. Only under the pressure of the revolution itself could a further differentiation of political currents occur, expressed by the founding of the Communist Party (KPD) on New Year’s Day 1919. By the time this process concluded, however, the revolution was already at its end. The basic problem undermining the revolution was the fact that the workers’ movement as a whole had not prepared for it before 1914. Despite its Marxist rhetoric, the SPD in Imperial Germany did not cultivate anything approaching a revolutionary praxis. There was little real connection between the day-to-day struggle and the long-term socialist goal. Only the war would place the question of revolution suddenly and immediately back onto the agenda. The difficulty of making up for long-neglected political clarification in the heat of the revolution itself — not least under constant threat of counterrevolutionary violence — ultimately led the revolutionaries to defeat. The SPD continued to command respect and loyalty among a broad swathe of the working population, and, tragically, this party also perceived the radical left as a greater danger than the Right. Friedrich Ebert’s social-democratic government permitted the counterrevolutionary military to strike a decisive blow to the revolution. At first the workers’ parties had been forced into a short-lived pact. Though the Shop Stewards and their allies had dominated the upheavals in Berlin on November 9, the Left was nonetheless compelled to accept an alliance with the SPD and form a government together with it. Pressure from below clamored for “unity” and equal representation for both workers’ parties in the new government. The workers and soldiers took command in the factories and barracks by forming their own councils, but had no intention of consolidating them into a permanent state. Most workers trusted that the armistice had removed the war question — understood as the essential reason for division — and that the socialist government between SPD and USPD formed on November 9 would now begin to “do” socialism. “Socialism” in 1919 meant socializing the key industries viewed as “ripe” for such change, primarily the major state-owned factories, mining, and heavy industry. The term “socialization” was usually understood to mean nationalization, though the councils insisted on certain rights to co-determination and oversight. The state implemented social policy from above, and party and trade union policies were determined by leaders whom the masses were expected to approve on election day. In this sense, the councils’ mere existence in November 1918 represented a radical break with the state-focused representational practices and ideas common to the socialist movement under the monarchy. This lack of clarification explains why the first Council Congress held on December 16–20, 1918 rejected the council system as a model for the new state, instead calling for elections to a bourgeois parliament in the form of the National Assembly. The Congress was the first nationwide assembly of Councils. SPD delegates, who represented the majority, carried the decision. Though the USPD agitated on behalf of the councils, which had already occupied real positions of power, these latter only represented a practical political alternative for a minority of workers. The majority at this point went with the Social Democrats and their program for a National Assembly, which they shared with the bourgeois parties. This overlap between the SPD and bourgeois policies was not the result of any betrayal or change on its part, but rather the product of years of parliamentary activity under the monarchy. The SPD simply could not fathom what a council-based democratic social order or workers’ control in the factories would even look like. Its delegates to the Council Congress were mostly movement veterans, socialized in trade unionism and municipal parliaments. The Left did not have a particularly clear platform either. Indeed, its theorization of the councils only took place markedly after the councils themselves seized power. Neither anarcho-syndicalism nor Marx’s analysis of the Paris Commune had much of an impact in Germany, and describing them as predecessors to the councils thus makes little sense. The first councils emerged spontaneously during the 1917 and 1918 mass strikes, while their theorization developed only in early 1919. In practice, workers had not read anything on council socialism, and even leaders like Richard Müller would theorize their experience only during the revolution. The council movement was “learning by doing” — going from practice to theory, and not the other way around. Richard Müller and Ernst Däumig from the Revolutionary Shop Stewards would have a strong influence on theoretical debates on the Left through their magazine Der Arbeiter-Rat. Their theory of a “pure council system” mixed with anarcho-syndicalist ideas grew into a real, though ultimately failed mass movement in early 1919. The occasion for the strike movement in March 1919 was the population’s dwindling faith in the work of the so-called People’s Deputies and the National Assembly convening in Weimar. The biggest source of discontent was the government’s foot-dragging on socialization policy, but the government had also committed several acts of violence against the Left in December and January. After gunfire was exchanged during a failed coup attempt on December 6, 1918, open warfare broke out in central Berlin on Christmas Eve when government troops fired on the City Palace housing revolutionary sailors. Only the intervention of Berlin’s populace in the form of a mass demonstration was enough to stop the attack. Following these events, the USPD People’s Deputies left the government and were replaced by Social Democrats, including Gustav Noske as Defense Minister. A second scandal followed in January 1919 when the president of police, USPD member Emil Eichhorn, was to be removed from office. A general strike broke out in response, which parts of the radical left sought to expand into a second revolution, but the uprising was poorly prepared and barely coordinated. The movement remained restricted to Berlin and was bloodily repressed, and the government remained in power. Following the uprising’s defeat Rosa Luxemburg and Karl Liebknecht were murdered by right-wing Freikorps commanded by SPD Defense Minister Noske. The consequences of the January Uprising were catastrophic. The Left lost two of its most brilliant minds and the defeat demoralized Berlin, the center of the revolution, for months. Shortly thereafter the symbol of the Bavarian revolution, Kurt Eisner, was murdered in Munich. The January Uprising weakened the revolutionary left decisively, while also revealing how far Ebert’s government was willing to go to win. Mainstream German historiography generally defends Ebert’s pact with the generals, arguing that this curious alliance between monarchist Freikorps and the Social Democratic Party was necessary to prevent civil war and stabilize democracy. This tends to overlook the fact that the radical left also fought for democracy — albeit its own version. For the USPD and the young KPD, transitioning big industries into public ownership and regulating the economy through elected workers’ councils were necessary preconditions for a socialist democracy. Only capitalists were to be excluded from voting — the essence of the “dictatorship of the proletariat” that featured in both parties’ programs. Though the details of socialism were hotly debated even on the Left, the dictatorship of a single party — let alone individual — was widely rejected. The most peculiar thing about the claim that the government sought to “prevent civil war” is the fact that such a civil war was already raging, and it was the Freikorps commanded by the SPD that not only failed to prevent it but repeatedly escalated it. 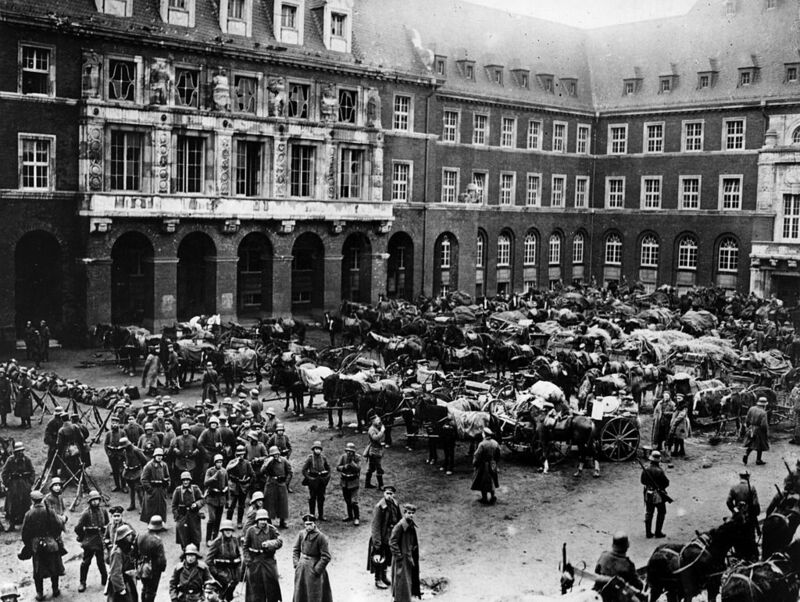 By Christmas 1918 the overwhelming majority of World War I conscripts had gone home — the soldiers’ council movement collapsed overnight. Beyond scattered left-wing formations like the “People’s Naval Division” and the “Republikanische Soldatenwehr,” the only troops still active were those with no home to return to or who had simply enjoyed the experience of war. These were paid mercenaries and monarchists, men who often believed in ethno-nationalist and “Greater German” ideas. Many had been promised land to settle in the east after Germany’s victory, and their hatred for the supposed traitors back home knew no bounds. Antisemitism was common, blaming “the Jews” as responsible for both the Revolution and German defeat. This hatred fueled their violence and made them the perfect choice to crush a socialist uprising. The strikes in March 1919 represented the climax of a German civil war that essentially lasted until April 1920, when a last insurrection in the mines of the Ruhr region was crushed. Unlike the January Uprising and the later Ruhr uprising, the strikes in March 1919 were spread across multiple regions and thus much more threatening to the government. Mass strikes in the Ruhr, Central Germany, and Berlin demanded government recognition of the workers’ councils and the immediate socialization of key industries. The National Assembly in Weimar was practically besieged by the general strike, and unable to act. Yet the strikes were not coordinated in terms of timing or location. While one region was out in force, others were already beginning to stumble. They forced the government to make some concessions, constitutionally establishing the works councils (Betriebsräte) as a shop-floor representation of workers with limited powers. Even ideas for corporatist industrial planning on the regional and national level were written into the constitution, along with the legal framework that would have allowed the socialization of whole industries. But none of these latter provisions became reality, and the strikes that won these compromises were defeated one by one in spring 1919. This was an ongoing dilemma for the Left: while the government could make centralized decisions and had a disciplined army at its disposal, the revolution itself had no organizational center and no armed force to defend it. It essentially emerged from a peace movement and the majority of its members were not ready for a civil war. They only took up arms when they already had their backs to the wall. The same would be true for the March strikes. Despite the Left’s de facto defeat in March 1919, government troops continued fighting even after the end of the strike. As in January, the soldiers showed no interest in negotiations but instead sought to physically annihilate their enemy. The violence was especially brutal in Berlin. Defended by armed workers, the eastern districts of the capital were besieged and shelled for days. Troops following the orders of Gustav Noske had no qualms firing heavy artillery into residential neighborhoods, a callous act of revenge causing over a thousand deaths. The attack included air raids, making Berlin the first city in German history to be bombed from the air. Both the People’s Naval Division and the left wing of the Republikanische Soldatenwehr were liquidated in these battles, and with them the last republican troops in the capital. It was no coincidence that the National Assembly decreed the formation of a “provisional army” while fighting raged in Berlin on March 6, 1919. It envisioned an army with classical discipline, no more soldiers’ councils, and practically legalized the Freikorps. As the last republican troops were being picked off the paramilitaries of the extreme right were institutionalized as the new state’s army. This tragic birth defect of the Weimar Republic would play a major role in its later downfall. The constitutional article on works councils nevertheless remained in place, and still exists in German labor law today. Yet these councils were worlds apart from the idea of the “pure council system” that animated revolutionary workers in 1919. The works councils eventually enacted by law in 1920 promoted cooperation between business owners and workers — corporatism, instead of socialism. The defeat of the March 1919 strikes was thus decisive for the struggle for the new republic’s constitution. Unlike the January Uprising and the later local council republics, here a broad movement from the center of the working class came together to shift the revolution’s direction one more time — and failed. What remained of the German Revolution was the establishment of Germany’s first democracy, including women’s right to vote, the works councils, and the eight-hour day. These all constituted democratic advances. Yet this program was asserted in opposition to the majority of the working class, who had instead fought for a more radical, socialist democracy. A version of this article first appeared in neues deutschland. Loren Balhorn is a contributing editor at Jacobin and co-editor, together with Bhaskar Sunkara, of Jacobin: Die Anthologie (Suhrkamp, 2018).